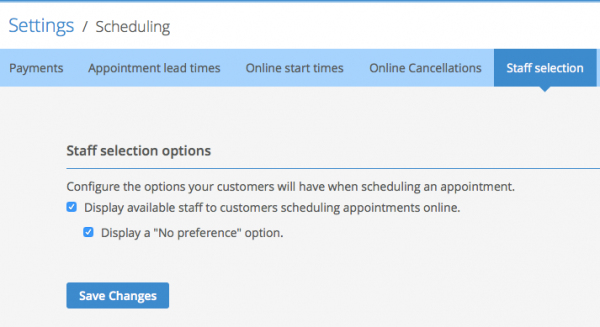 Staff Selection options let your business determine what clients see when choosing a staff member during the online scheduling process. The feature is found under Settings > Staff selection and there are a few ways you can set it up. 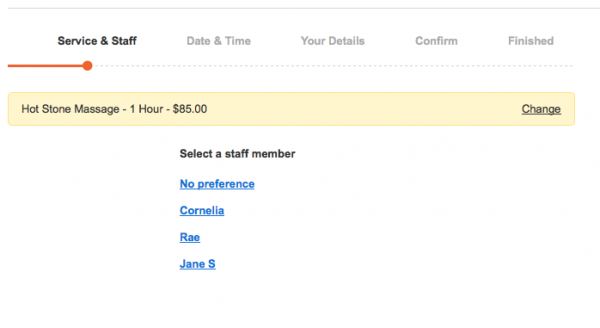 Option A: Clients see both staff names and a No preference option. When both boxes on the Staff Selections options page are checked, clients will see the names of your staff members, along with an additional "No preference" choice. 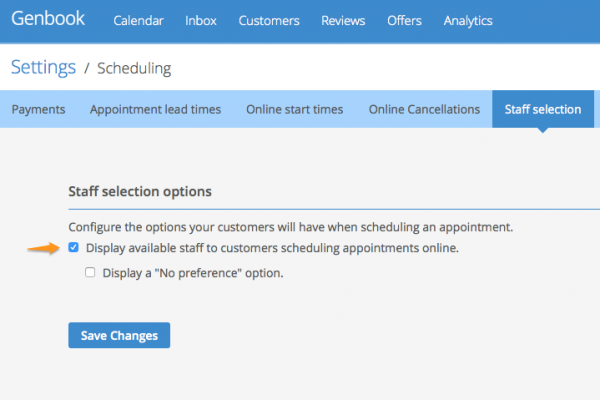 This is useful if you have some clients who prefer to always book with a particular service provider, and others who would rather have more appointment time choices and/or don't have a staff member preference. If your client chooses "No preference", the "Date & Time" page will show all the availability your business has, across all your staff. 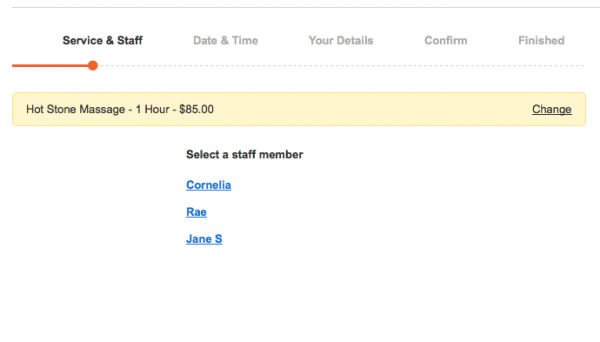 If she chooses a time and date when multiple staff members are available, Genbook will randomly assign the appointment to one of the available staff. In order to give your business the freedom to move the appointment to a different staff person if needed, the confirmation email will not contain the name of the staff member assigned to the appointment (see example below). Option B: Clients see only staff names. Checking only the top box on the Staff selection options page ("Display available staff...") removes the "No preference" option from the scheduling page. Clients will have to choose a staff member by name. This is your best option if your clients need to always choose a specific staff member for continuity reasons. Option 3: Clients don't see staff names at all. When none of the boxes on the Staff Selection options page are checked (which happens automatically if you uncheck the top box), your clients will skip the "staff selection" page entirely. 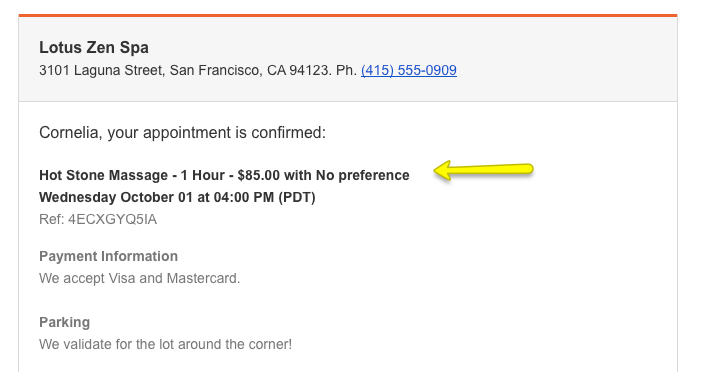 Their scheduling experience will take them directly from the service selection page to the date & time selection page. The appointment will be assigned randomly to a staff member, if multiple staff are available at the chosen time. This is the best option if your business doesn't fit the traditional service provider-client mold (e.g. 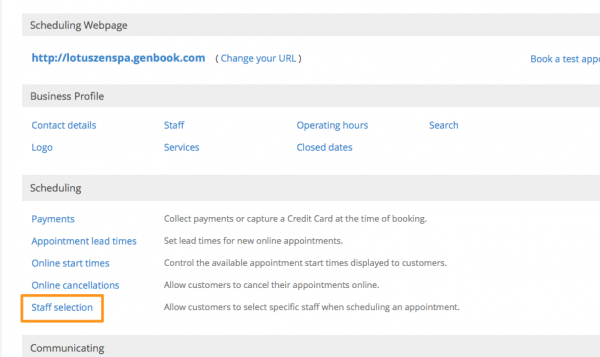 if you're using Genbook to schedule identical rooms/facilities or equipment, instead of staff).